The 2014 edition of Rock the Runway, an annual fund-raiser for Goodwill Industries of Central North Carolina, had a decidedly Spartan flair: Five of the seven designers tasked with making new fashions out of Goodwill donations had UNCG ties. 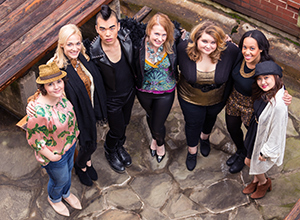 Current UNCG students John Lin, Rachel Wilson, Ayanna Harrison, Nhi Tran joined alumnae Carrie Coyle as designers for the event, which was held Friday, Feb. 21, in downtown Greensboro. Tran won the contest. Each designer was given $200 to purchase items from Triad Goodwill stores and $50 to cover any additional expenses. They added in dozens of hours envisioning and building their runway designs. “They are being provided the kind of instruction in which they feel that they are competent to engage in these kinds of activities,” she said.